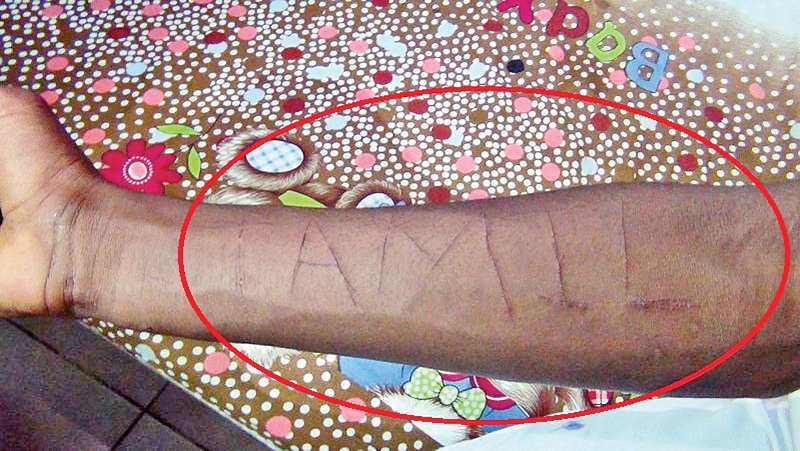 Talawakelle Police are conducting investigations to arrest a group of suspects who had allegedly assaulted a grade 10 male student of Talawakelle Sumana Maha Vidyalaya and forcibly tattooed the words ‘Tamil’ in English on his hand using a sharp implement on November 23. Police said the incident had occurred while the student was walking back to his home in the Talawakelle Housing Scheme after school along the railway line. Police said the student had not reported the incident to his parents but remained at home the following day without attending school. When he attended school on November 25, he had related the encounter to teachers who made inquiries after noticing the bruises on his body. The teachers had made a complaint to police. The student who was admitted to Talawakelle Hospital has been transferred to Nuwara Eliya Hospital for further treatment. In his statement to police, the student had said a group of eight people armed with wickets were involved in the assault. Investigations revealed that the student had engaged in a clash with another student on his way home and a group supporting the other colleague had carried out the attack on him to avenge it.